Organic. Pumpkin Oil is a rich dark green oil with a delicious nutty texture that is packed with nutrition and tastes great on salads. It’s good for your heart, great for your skin and high in antioxidants. A power packed oil that you will love! High quality pumpkin seed oil is often used as a salad dressing mixed with fresh lemon juice or a good apple cider vinegar. It can also be used to add flavor and nutrition to soups, sauces and many other recipes. It should not, however, be used as an oil for frying or in baking as high temperatures can damage its delicate structure. Pumpkin seed oil is being labelled the next superfood due to its very high levels of nutrients and benefits. It could soon take over as the oil of all oils and kick Coconut Oil off its high status with the health food lovers. 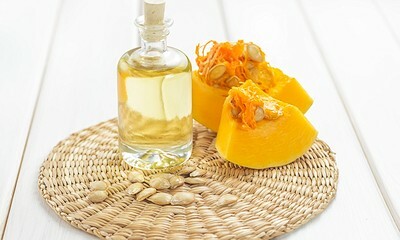 Coconut oil contains vitamins E and K; Pumpkin Oil is rich in those and vitamins A and B (which is connected to hair growth), as well as zinc (which is vital for scalp health and hair strength). Pumpkin seeds are loaded with all the nutrients that your hair could ever want, like protein, omega-6 fatty acids, zinc, and iron. When it comes to skin, the high amount of polyunsaturated fatty acids and natural antioxidants in Pumpkin Oil can help maintain normal cell structure and retain moisture, which keeps skin youthful and hydrated. The high amounts of zinc and vitamin E also improve skin tone, help wounds heal more rapidly, fight acne, and help with skin renewal. Many of the minerals and vitamins have anti-aging effects as well. Pumpkin seed’s health benefits also work from the inside out. The oil can lower both cholesterol and blood pressure thanks to its phytoestrogens and phytosterols, for example. The oil also is a rich source of omega-6 fatty acids and vitamins E and K. Pumpkin seed oil contains linoleic acid, an omega-6 fatty essential fatty acid. The omega-6 fatty acids are crucial for normal growth and development and for brain function, and they help to stimulate hair and skin growth, regulate metabolism, and maintain bone health and the reproductive system. The tocopherol in pumpkin seed oil is a powerful antioxidant, also known as vitamin E. This helps the body use vitamin K. It also has a role in the formation of red blood cells. Pumpkin seed oil is a good source of vitamin K. This vitamin can help promote strong bones in elderly people. It’s needed by everyone, reveals the UM Medical Center, because blood would not stick together, or coagulate without it. So it really is a superfood. Add it to your salads, drizzle over raw food, and use it in your dressings. Your hair and your skin will love you for it!